We've all seen them - exceptional advocates who stand head and shoulders above their peers. Advocates who connect, explain, and persuade with ease. Advocates who compel their audiences to action. If you possess the desire to be just such an advocate, Stetson's Online LL.M. in Advocacy is for you. The LL.M. in Advocacy was designed to foster participants' development into full-spectrum legal advocates by challenging common assumptions about advocacy, encouraging personal growth, and teaching how to couple advocacy skills with sound legal analysis and strategic planning. 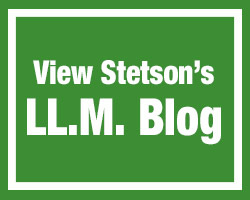 With the demanding schedules of practicing attorneys in mind, Stetson's LL.M. in Advocacy program uses a part-time, distance-learning model, similar to our highly successful Online LL.M. in Elder Law program. The vast majority of course work is conducted online through activities such as viewing lectures, contributing to discussion boards, and submitting video content; with in-person participation required 1-2 times per semester. Generally, lectures are prerecorded and students view them at their convenience within a given timeframe. Other components are conducted in real time. Regardless of individual component formats, the program as a whole is designed to be as flexible and convenient as possible. Advocacy isn't an afterthought at Stetson; it's our core mission, and it shows. Since U.S. News and World Report began ranking trial advocacy programs, Stetson has been ranked first place 20 times. No other school even comes close. Stetson welcomes talented individuals who possess a broad range of professional and academic experiences, and who meet the eligibility requirements.